Stay at this classic and newly refinished 2BR log cabin with exclusive access to Crooked Pine Float. Walk to Boothbay Harbor to explore beautiful Barrett's Park and dine at the infamous Lobster Wharf and the new Oceanside Restaurant and Dock. Sleeps 4. Your secluded vintage cabin is steps from the Crooked Pine Float with great kayaking and fishing, and walk to nearby Barrett Park, with its ocean swimming. The furnished front porch is the perfect perch to take in the forest views and fresh Maine air. Inside, a warm cabin feel is dotted with special details: rough-cut log walls, glowing hardwood floors, large skylights in all rooms, cozy rugs, and a festive wall tapestry. The living room has plenty of seating between a couch, chairs, 2 bench areas, and a desk. The wood burning stone fireplace warms the whole cabin, along with a few space heaters for extra coziness. Catch up on your favorite shows on the 24” cable TV. A rustic dining table seats 6 alongside sweeping forest views. The full-size kitchen has all-new appliances, and everything you need for picnic lunches, hearty breakfasts, and special dinners. A peaceful back deck features a new propane grill. The guest bedroom has two twin beds, and the master bedroom has a queen-size bed. The shared full bath has a stunning claw foot tub and shower and plenty of natural light. Amenities include a washer/dryer and parking for two cars in the driveway. 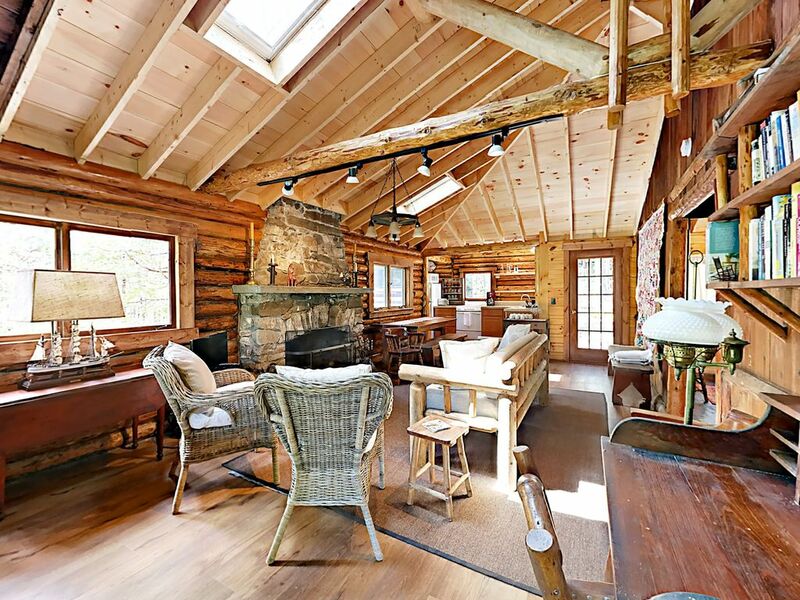 This pristine cabin retreat is a walk or a drive to central Boothbay Harbor and its excellent restaurants and shops. Walk or drive to Boothbay Lobster Wharf, the new Oceanside Restaurant and Dock, Browns Wharf Restaurant, and gorgeous Barrett's Park. Numerous popular Maine attractions are also within easy driving distance. Spend an afternoon at the world-class Coastal Maine Botanical Gardens, or take a day at sea with Cap'n Fish's Whale Watching. Get an even closer look at ocean life at Maine State Aquarium, one of the top rated aquariums on the East Coast. Cute cabin, very clean and cozy. WIFI And cable work great. The place is exactly as shown. My only complaint was the very strong smoke (chimney) smell throughout. We so enjoyed our stay, we 3 felt it was our best family vacation to date, as we had more R & R, able to cook meals, great shower and beds, coffee pot worked fine, it had everything we needed. Private and Convenient at the Same Time! We loved this rustic, yet well-appointed cabin! It was quiet and private, yet very close to all that Boothbay Harbor has to offer. Property manager was super helpful and the property was immaculate! Would stay here again in a heartbeat and recommend it without hesitation. Perfect Combination of Rustic and Comfortable!!! This is a beautiful and private cabin is close to Boothbay and all it has to offer! Very cozy and nicely appointed for the perfect couples' weekend getaway. Would definitely book again and Turnkey Vacation Rentals does a STELLAR job! We had a great time celebrating our honeymoon is this amazing cabin. Great location and peaceful area. The fireplace added so much ambience to the cabin. We loved sitting on the porch every morning and just listening to nature. Very close to town and food stores for easy access. Would recommend this to anyone! This cabin is adorable. The photos must have been taken with a wide angle lens because the cabin is much smaller than it appears but it was perfect for us, a couple with a dog. The bed is super comfortable, the claw foot tub perfect for a soak after an active day, and the fireplace wonderful on cool evenings. We also loved to drink coffee and read on the front porch. The close proximity of town and a couple great lobster shacks was an added bonus. We also enjoyed some local hikes and a day kayaking to Burnt Island and the surrounding area. Sprucewold is a community of quaint log cabins, many overlooking Limekin Bay. The only downside was some loud music a couple of nights that may have been coming from Linekin Resort across the bay. Visiting off season we were surprised by the noise and wondered if it would be too noisy for us during the summer. Overall we had a great stay and would recommend the cabin and area in general. Turnkey was also wonderful at making sure our needs were met and offering early check-in and late departure. We hope to be back!